I like helping people a lot. I discovered this after I finished the Hawaiian Ironman World Championships and tore my Achilles tendon while training to qualify for next year’s race. During this time in my life, each day was designated as either a training day or as a rest day or “lost day” when I couldn’t train due to work or other un-avoidable commitments. Basically, it was a life that was mostly about my triathlon training and my sales goals and outdoor industry social life surrounding my job at Diamondback Bicycles. When the micro-tears on my right Achilles tendon threatened to turn into a permanent rip straight through the tendon that would require surgery and months of re-hab, I had to finally stop running and cycling. No more training rides or runs with my triathlon friends. I dropped out of Ironman Canada and focused on swimming Masters five days a week. At least until I blew out my right shoulder. Then I had to stop swimming, too. Soon after, I got pregnant with our first child, a healthy blue-eyed bald headed little boy. As a new mom I discovered the joy and reward of giving myself to helping another. Two and half years later our daughter was born and by then, I was in full-mommydom and basically never saw our old triathlon friends much at all. The tires on my Baby Jogger wore out before my road bike tires that I had bought brand new just before the first baby. Months turned into years between triathlons and I realized that I needed more than a daily workout or a race to feel alive and accomplished. And, I would rather spend hours with my kids than sitting on a bike seat far from home on a 50-mile training ride feeling guilty and rushed. For the next decade I stopped doing long triathlons and focused on an annual Sprint Triathlon or marathon race that I only had to train once a day for. One by one, my old triathlon friends were replaced by new parent friends that I met through our kids. As the kids got older, they needed me less and things just got plain easier all around. In June 2005 I stopped working full-time and started volunteering more to exercise my altruistic care-taking muscles that I developed being a parent. In 2005, husband and I started a non-profit organization to help survivors* of natural disasters the week after we returned from living through the Andaman Sea tsunami disaster with our kids during a family vacation in Thailand in December 2004. My husband gave our foundation a big name that reflected his big plans for it: Kirwin International Relief Foundation, or “KIRF” for short. But, it’s really just us two volunteering our time, writing grant proposals and infusing it with any cash we have left over from paying the bills. I like to think of KIRF as our way of doing something really rewarding with our lives and a way to exercise our altruistic muscles that needed to be worked out by the both of us since neither of us in a classical “helping profession.” I design and build web sites and he’s a trial attorney and mediator who doesn’t mostly business cases. We fund sustainable and culturally appropriate projects that help people regain their economic self-sufficiency and we also purchase supplies that people tell us that they need after a disaster. The need I discovered for cultural competency when doing field work, of building rapport with the locals and the many inefficiencies and mistakes made by larger non-profits inspired me to pursue a masters degree in cultural anthropology at CSUN. Much of our sustainable development work and educational scholarship programs that we fun was inspired initially by my mother-in-law Diane Kirwin who started KIRF India and has been helping street children, usually Dalit caste kids, get an academic education, medical care and nutritious food in Bihar, India since 2003. Since January 2005, we’ve helped out in seven countries: Thailand, India, Burma, Cambodia, Peru, Mexico, Tanzania and the United States. Most of our projects cost a few thousand dollars. In countries like Thailand, the exchange rate amplifies our buying power exponentially. For example, $10,000 in funds to purchase supplies in Thailand in January 2005 was like having $70,000 here in the United States. With about that much, we funded the rebuilding of a co-operative fish farm, and purchased dry goods, food supplies, school supplies and two fishing boats for three coastal villages that got destroyed by the tsunami flooding in Thailand as part of our tsunami relief work. Honestly, I really didn’t (and to a certain extent, still don’t–sorry!) have a single or simple answer. When pushed for an answer I would often tell them that it’s our way of giving back since our lives were sparred during the tsunami disaster. But the real answer is that it just feels normal. and, it’s extremely rewarding and can even be lot’s of fun–albeit exhausting with 15-hour days of work while in the field and fundraising is always an un-fun challenge. But, the truth is, it seems like the right thing to do. I hesitate to give that answer because I don’t want to imply that everyone has an obligation to help others by volunteering as a humanitarian. That’s judgmental, self-centric and as ludicrous as saying everyone has an obligation to have children, etc. And, that’s not how I feel anyway. 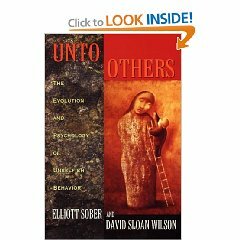 So, in my Evolutionary Anthropology course last semester I was delighted to be assigned a book that explained altruism from an evolutionary perspective: Unto Others: the Evolution and Psychology of Unselfish Behavior by Elliot Sober and David S. Wilson. From an evolutionary standpoint, altruism can be explained as an adaptation that helps to promote survival. But, to promote the survival of whom? Certainly not the individual altruist according to this definition: “a person unselfishly concerned for or devoted to the welfare of others (Dictionary 2009).” This is true in our case at least, in that our “KIRF work” has cost us personally in time, money, and, even, this is difficult to say, but precious time away from our family and loved ones. An altruistic act is one that gives others a reproductive advantage while putting the altruist at a reproductive disadvantage (Campbell 2/18/09). Yep, that’s us. By why do we do this? According to scientists such as W. G. Hamilton, and many of the scientific community until the recently, altruism was best explained as an extension of individual selection and called “kin selection” (Moore 2001:58). Kin selection is an evolutionary adaptation to promote one’s genetic code by sacrificing oneself in order to help one’s kin (Sober 1998:58). Known as the “father of modern kin selection theory,” Hamilton was one of the first to promote kin selection as more in line with the new individual and genetically based evolutionary model called the Neo-Darwinian or Modern Synthesis Theory of Evolution (Moore 2001:166). The Modern Synthesis Theory combined Darwin’s theory of evolution through natural selection with heritability of traits and genetic research in the Twenties and Thirties. Richard Dawkins elaborated on kin selection and called it the “selfish gene theory” that claimed that we are “controlled by our genes whose only interest is to replicate themselves (Moore 2001:87).” However, kin selection, based on the modern syntheses’ gene-centric and individualistic theory of inheritance, does not explain the evolutionary adaptive altruistic behavior of non-genetically related (non-kin) individuals. Group selection is the better theory in predicting altruistic behavior in humans and non-human primates according to Elliot Sober and David S. Wilson in Unto Others: the Evolution and Psychology of Unselfish Behavior. Group selection is “when an allele (or gene) increases in frequency if it bestows an advantage to the group, regardless of its impact on the individual (Campbell 2/25/09).” In other words, Charles Darwin had it right when he explained that a group of altruists would be reproductively more successful than a group of non-altruists. He didn’t specify that they had to be kin (Sober 1998:5). A population increases faster with more altruists according to John Maynard Smith with his Haystack model in 1964 (Sober 1998:68). On the psychology side of research, studies done by Daniel Batson have shown that the key to altruism is not self-interest (genetic or otherwise) but is empathy. His research has shown that most people have an innate willingness to help a stranger when they feel empathetic about them (Richardson 2005:217). And, back to the biologists, altruistic behavior is not limited to humans. Biologists have documented several examples of group selection with the presence of altruists increasing group fitness in non-humans. For example, the brain worm (or liver fluke) relies on the altruistic and suicidal behavior of several individuals in a population to promote its survival as a group (Sober 1998: 27). An experiment with guppies shows that even non-human creatures such as fish choose to associate with altruists. In the experiment, it showed that even guppies preferred the company of altruists of their own species who risked sacrificing themselves through dangerous predator inspection behavior. (Sober: 1998:140).” With that in mind, and the greater ability of humans to detect altruistic behavior through cultural transmissions and communication, (compared to guppies), helping others seems normal and biologically natural. So, according to science, altruism is an evolutionary adaptive behavior that increases the fitness of groups in both humans and non-humans and it’s trigger is empathy. That seems to make sense to me. I can’t tell you how many times, after helping a brave family by giving them some mundane items that I bought for them for their temporary shelter, after an earthquake or hurricane leveled their family home and turned their lives upside down, that I’ve had to fight back tears at their courage. And, I feel unworthy of their gratitude for the little that we could give. If there’s one thing that I know for sure (to paraphrase her Oprah Winfrey), is that doing disaster relief is living with lot’s of empathy. Too much at times It would be actually, easier to do my job helping others if I had less of it, from an emotional perspective. Just a few months ago, during Inauguration Week in Washington, DC, we helped out a transitional living facility (a fancy name for homeless shelter for little kids and their mothers) by purchasing and delivering play and educational supplies for the Homeless Children’s Playtime Project (HCPP). After playing with the shelter’s young residents one night, how I badly I wanted to do more for these kids who are being cheated out of so much in life. That part of being altruistic and feeling empathy is not easy at all. Yes, I cried. But, it feels natural and so good to make a difference, too– even if its a little. At least, I know I did something. And, those that I helped know that I believe that they are worth helping. It’s not a lot but it’s good enough because I did my best. Now, even science recognizes the worth of helping others, or altruism, and calls it “group selection”– an evolutionary adaptation that improves a specie’s fitness. I find that re-assuring and cool. 2005 Not By Genes Alone: How Culture Transformed Human Evolution, Chicago, IL: University of Chicago Press. 1998 Unto Others: The Evolution and Psychology of Unselfish Behavior, Cambridge, MA: Harvard University Press. *I hate the term “victims” because it doesn’t recognize their often heroic efforts to prevail under truly horrific physical and emotional traumas; it’s undignified. This entry was posted in Altruism & Group Selection, KIRF by arkirwin. Bookmark the permalink.